THE DIRTY ARMY: Nik, this photo makes me wanna take 1 gram of fentanyl. Why the f**k would you go from a nice toned body to harpoon status? This photo is surprising to me because I assumed most plus size models were fat from the getgo, this girl actually had a nice body so why on earth did… this happen? What do u think Nik? Do u think she will ever return to her fit girl sensibilities? UGH! I’m going to throw up! It looks like she went in for breast implants and got total body implants. Yall can say what you want. I saw her at a casting call in LA recently and she is definitely easy on the eyes in person. Cute aussie accent too. Lol. I showed my dad this and he’s like wtf would she do this. She wont be loathing her old self when she gets diabetes and they have to cut her foot off. She is probably into BBC. And plenty of BBCs have been into her. ITS CALLED LAZINESS. EVERYTIME I SEE A FAT CHICK, THE FIRST THING I THINK IS I WONDER IF THE PIG DID P90X OR ANY OTHER TYPE OF EXERCISE TODAY? THE ANSWER IS HELL NO! 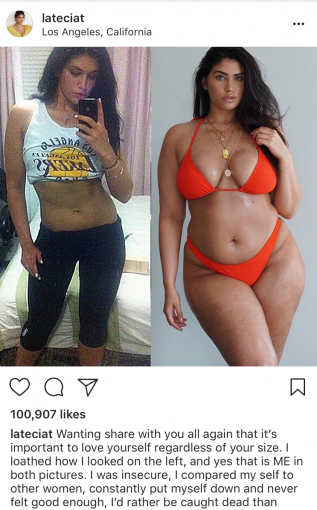 THEY ARE FAT BECAUSE THEY ARE LAZY SLOBS THAT EAT POORLY….THEY DESERVE TO LOOK LIKE THAT.